Love these bags, I own an art supply store and the front compartments are perfect for drawing utensils and smaller items. My customers love them because they're durable and are able to be cleaned how great is that! !Just placed my third re-order, very happy customer here!! I have been a farmer since a young boy my family also owns 3 farmers markets in town selling all types of fresh groceries.. We believe in the "green" movement and play our part in saving the planet. We use custom earth promos for all of our farmers markets bags, business cards, pens and other promotional items.. Great company highly suggest using them! Professional staff, great product, the bags came out as we pictured and made our company really shine at the trade show. Great bags the quality is better then the last supplier I was using..
Love the large size of this bag! I can fit all my work stuff in here, lunch, plus all the other misc. items I carry every day on my long commute.. Some times I stuff this bag to the max and it gets pretty heavy, the bag is still going strong 1 year later. Definitly recommend this bag! I believe in green products and custom earth promos is a great company for everything your business can need..
We were able to fully print our custom graphic on all sides of the bag.. Very personalized experience and easy to work with the CEP graphic design department..
Love that the bags are laminated!! Love the full print graphic option on the laminated bags!! I haven't found anyone else on the internet that can do this on a 100% recycled bag! For sure will be a repeat customer. Great bag!!! This bag is great! Attractive yet practical. Custom Earth was very attentive to every question I had and the end result was fabulous. I will be ordering from them again for sure! I deal with tons of manufacturers and suppliers everyday at my job.. Customer Service is HUGE with me.. I get the best customer service from CEP - their staff is amazing, the owner, graphic designer and the rest of the staff I have dealt with is great and always reachable for assistance and the products are amazing. Take this from a professional consumer, no better company for promotional green items. I have used a couple company's prior to custom earth promos for recycled reusable bags and I must say they have the best craftsmanship and quality at this price point. There bags have extra reinforced stitching around the handles which was the biggest problem we had with other suppliers, the handles would rip over time. I strongly suggest using custom earth promos. This is an all around amazing bag! Strong, useful, and portable! I love how spacious the main compartment is on this bag! Will be ordering again soon! So affordably priced! Can't wait to see my clients reactions! I use these bags to do my grocery shopping, beach trips, kids sleepovers, the dogs toys/food, party items, and the list goes on.. As a mom of three the uses are endless and the bag has stood the test.. Highly recommend for any mothers out there. As a small business owner these bags have been the best way to get my business's name out there in the community.. Thank you Custom Earth Promos! Lamination is great, high quality. Love that I can clean the bag so easily. The perfect low maintenance bag! So easy to clean and so portable! This is the perfect bag for my clients to take on shopping trips. A great way to get your business out there! This is an all around amazing bag! Sturdy, portable, and attractive! Really impressed with the overall quality and appearance of these bags! I love how tough these bags are! They can really withstand some heavy lifting! I own a surf shop and these are the perfect beach bags.. Perfect size and my logo's image looks great..
Great bag!! 6 stars, not 5!! I love these laminated bags, such a good way to promote our company and will last forever!! Our grand opening event was a huge hit and I now see our bags all around town, thanks CEP!! I received great customer service from beginning to end. The product was great as well. I would recommend this company to a friend. Awesome bags, all of my clients use them, so many uses!!! Been in the recycling industry for a long time.. I strongly suggest using recyclable reusable bags they are eco - friendly and are way more practical than those plastic one-time use grocery bags.. My local grocery store now only uses reusable bags from Custom earth promos.. So many color options!! Very easy to use website!!! good bag.. my customers are very happy with them.. I am a yoga instructor and have been using this bag for 2 years, traveling from class to class. It is perfect for traveling with all of my yoga equipment. I recently just opened my own studio and placed an order with CEP to hand out a free bag to clients with the purchase of a yoga mat. So far it has been a success, all my clients use the bag to and from class. I highly recommend this bag for any small business owner. I live a green lifestyle and only use green products.. The easiest way for someone to change there life to a green lifestyle is to use recyclable reusable bags.. A bag is one of the most practical tools we use daily, if you just think how many times you throw out those cheap unreliable plastic grocery bags you will be appalled, each time you do that it pollutes our earth at our landfills.. 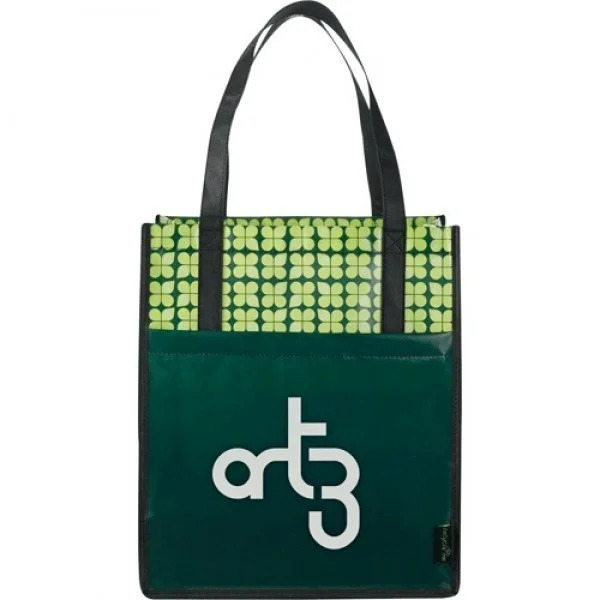 Custom earth promos makes a high quality bag and they play a big part in helping our environment by spreading awareness.. I love this company!! Perfect for buying groceries and other shopping expeditions, as well as beach trips, outdoor events and more, the handy Custom Eco-Friendly Grocery Bag is the perfect size to carry several items comfortably wherever you go. So why not give your customers a useful, durable and attractive carry-all to remember you by? They’ll certainly appreciate it. 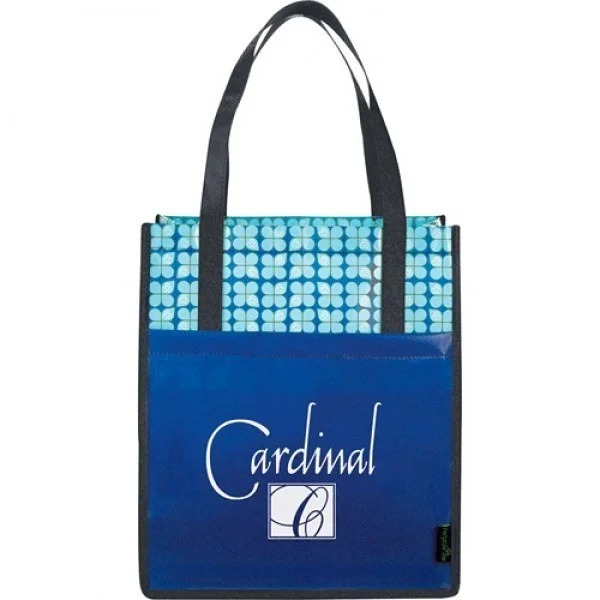 Custom Earth Promos’ Custom Eco-Friendly Grocery Bags blend style and durability with functionality. As always, this is ideal for environmentally conscious promotions, as the perfect alternative to plastic bags. Designed with solid reinforcements and bindings for long-lasting dependability, this bag’s generous compartment easily accommodates multiple groceries and other shopping items. Plus, it’s available in an array of colors, so your customers can choose their favorite. With all the features your clients will love, you need look no further for an eco-chic bag to display your custom message. You know a promotional giveaway product is successful when customers are really enthusiastic about it and use it frequently. And that describes the Custom Eco-Friendly Grocery Bag perfectly. One of the most popular products in the Custom Earth Promos stable, it is a practical solution that is perhaps the most natural choice for supermarket trips, beach outings and more. And the bag provides so many features that make it a great buy. With its exclusive design, this bag offers a spacious main open compartment that makes it easy to load your bag with several items. Reinforced handles and binding, plus a supportive bottom board, offer extra strength, so the bag won't give way under a heavy load. And a 10" handle drop height make carrying items simple and comfortable. 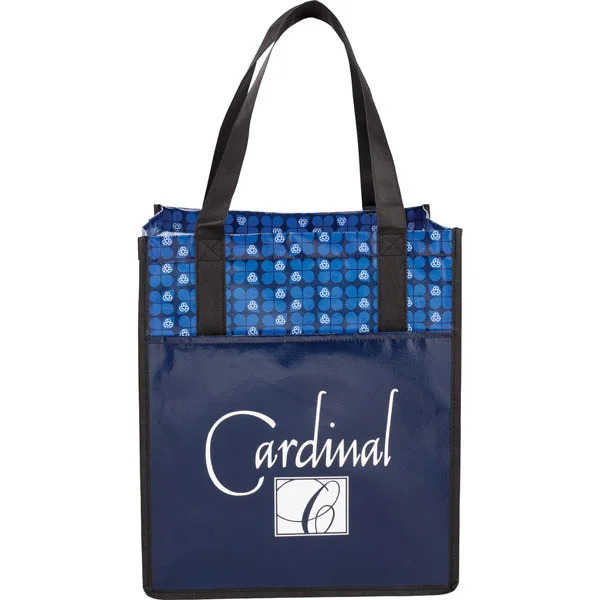 You are spoiled for color choices when you order your Custom Eco-Friendly Grocery Bags from us. From the basic black and red to a lighter lime shade and striking purple, you can have your bags designed in a way that best reflects your brand. Made from laminated non-woven propylene, these well-crafted grocery bags are reusable, water-resistant, simple to clean and 100% recyclable. A tough and flexible fabric, propylene is also an economical choice that meets Custom Earth Promos' stringent quality-control standards (measures thickness, appearance, and texture) before ever being produced. Allow us to help you show your environmental commitment to your customers and encourage them to adopt sustainable practices. 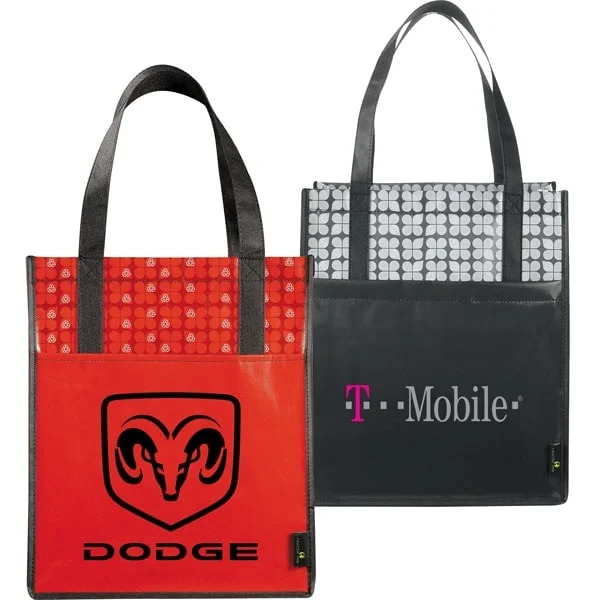 With our silkscreen decorating option, you can leverage our design team's considerable skill and experience to make sure your custom promotional bags always stand out in a crowd. 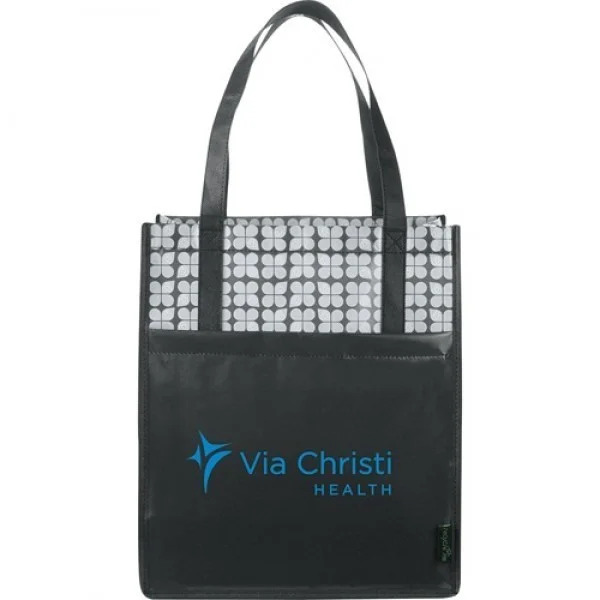 Just choose the design you want on your Eco-Friendly Grocery Bags, and our team will take it from there, imprinting your logo or other graphic flawlessly just the way you want. You are in control of the custom design, and we follow your instructions word for word, to the last detail. 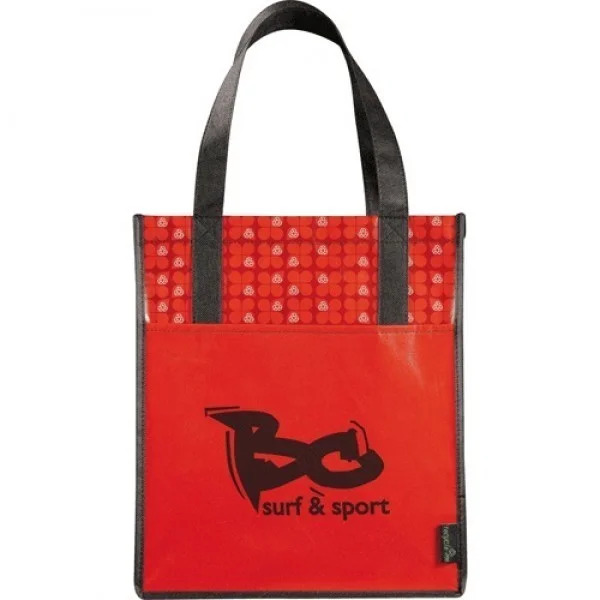 Non-woven polypropylene bags are a great way to promote recycling awareness. So make an eco-responsible choice and earn brownie points from existing and potential customers. And you can do this easily with Custom Earth Promos' Eco-Friendly Grocery Bag, an affordable option that can not only boost your marketing efforts in a big way but also help save the earth in a truly meaningful way.